Before setting off to a new location, we always do some basic research into what types of creatures call that place home. We also try to gauge the likelihood of us actually seeing them. There were a few big hitters on the list to see in Chitwan National Park, Nepal, including the one-horned rhino, royal Bengal tiger, sloth bear, great hornbill and the gharial. Gharial once inhabited all the major river systems throughout the Indian subcontinent ranging from Pakistan to Myanmar. 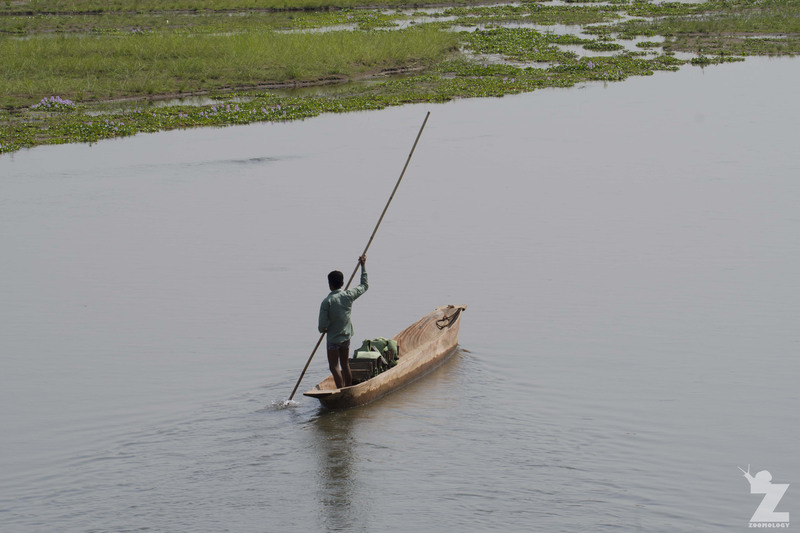 Their distribution is now restricted to just 2% of their former range (along the Chambal, Girwa, and Son rivers of India and along the Narayani River of Nepal). The habitat type in which they are found is that of flowing rivers rich with fish and steep sand banks on which they bask and build nests for their eggs. The first part of our two day trek in the jungle began with a canoe ride. 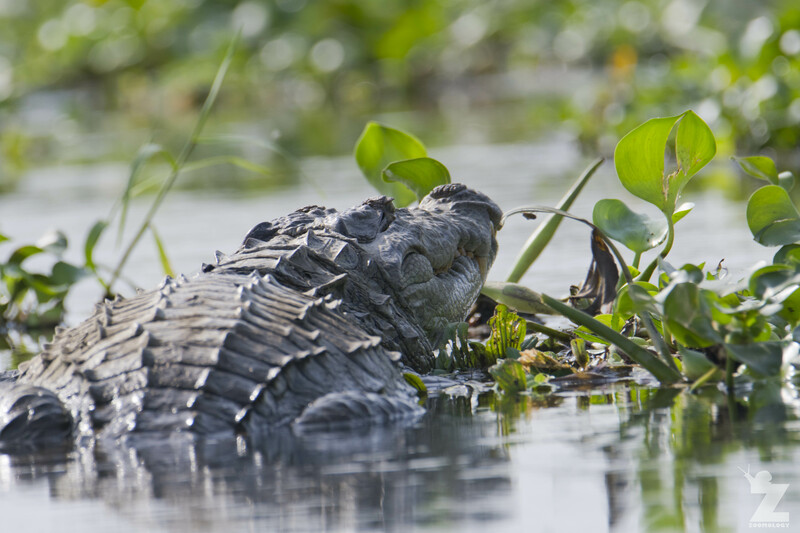 Once in the canoe, our friendly guides pointed out that three crocodilians can be found within Chitwan National park: the salt water crocodile, the marsh mugger crocodile, and the infamous gharial. On the first bend, we came across our first marsh mugger. This sighting was soon followed by another in which we were able to get much closer. Despite my initial thoughts (and perhaps yours) they are not called ‘marsh muggers’ because of their insatiable habit of mugging humans from the banks (however, this is something that has been reported), but the word ‘mugger’ is actually derived from magar, the Hindi word for “crocodile”. We were lucky enough to see several gharial. Despite the number of individuals being so low and their distribution so restricted, Chitwan is actually one of the last places where they can be semi-reliably seen in the wild. We were both struck by their huge size and their prehistoric dinosaur-like appearance, especially with their jagged dorsal tail scales and their armour-plated skin. Many threats to gharial and its natural habitat led to localised extinctions from Bhutan, Burma and Pakistan and Bangladesh. 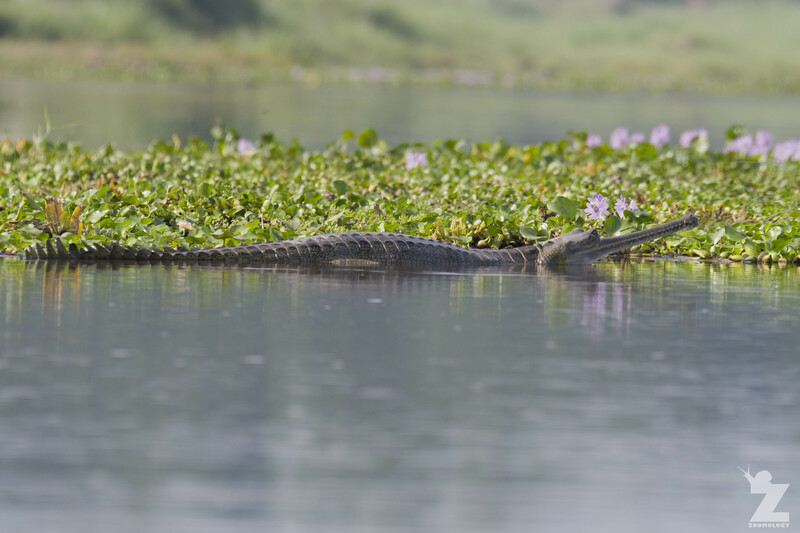 Factors responsible for decreasing gharial populations are water course adjustments and dam construction, pollution, habitat destruction and decline in food quality & quantity. Global populations declined from 5,000-10,000 individuals in the 1940s to fewer than 200 in 1975, the year they were finally protected. 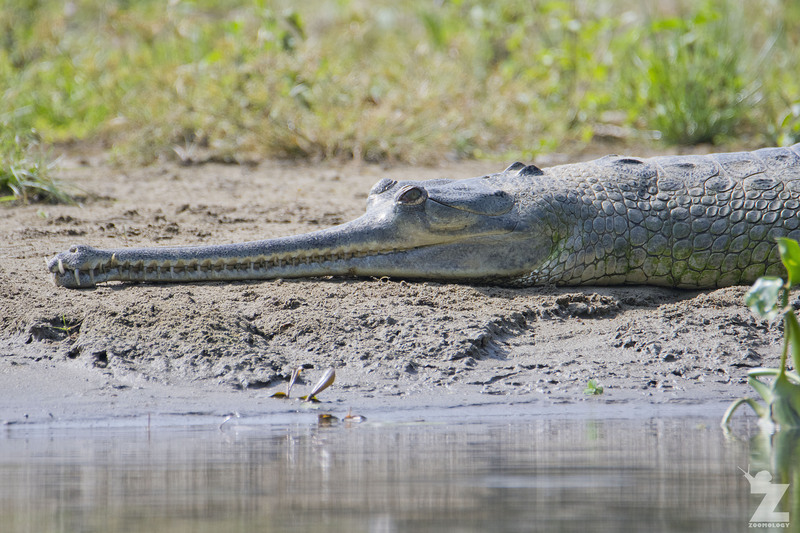 In 2006 the population estimates for adult Gharial were ~200 in India and ~35 in Nepal. Between November 2007 and March 2008, more than 100 dead gharials washed up on the banks of India’s Chambal River, severely knocking the already tiny population. Scientist believe the likely cause was from exposure to toxic chemicals in nearby polluted rivers resulting in gout and kidney failure. 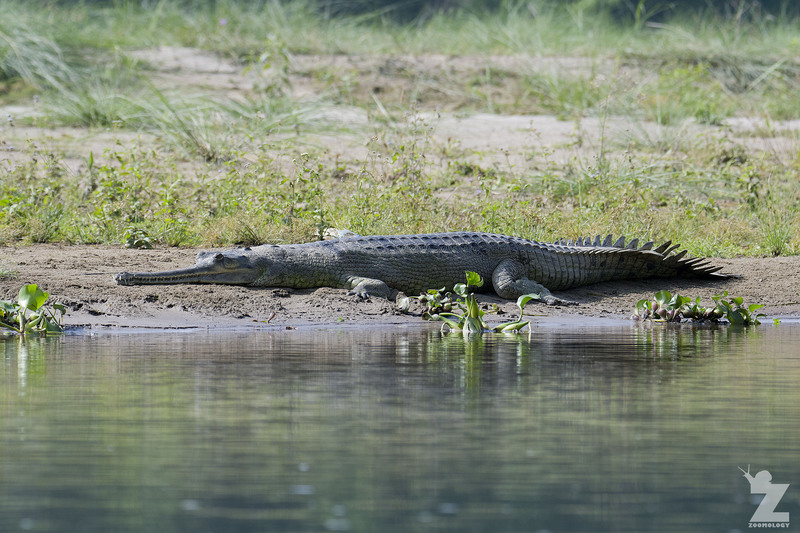 In 2008, the Department of National Parks and Wildlife Conservation (DNPWC) and World Wildlife Fund (WWF) Nepal held a Gharial census resulting in an estimated population of 81 individuals. As of 2017, the most optimistic global population estimate is approximately 550 mature adult individuals. They have the narrowest snout of any crocodialian. 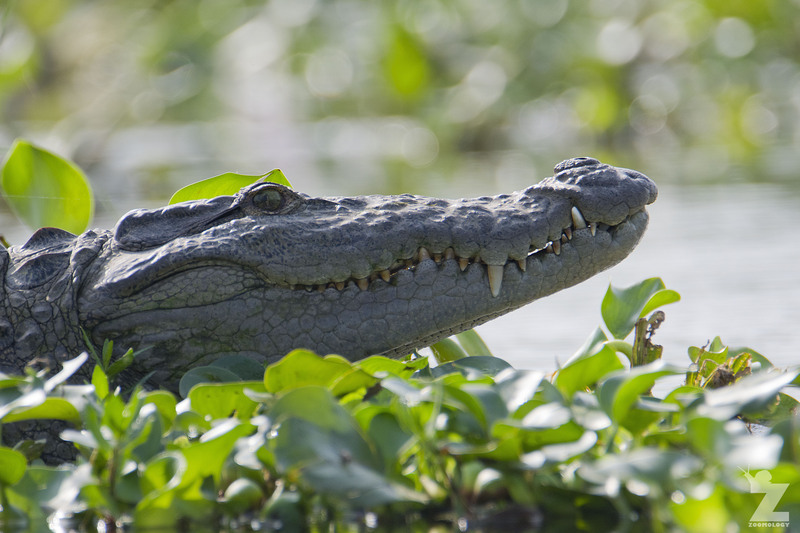 They are one of the largest of all crocodilian species. They produce the largest eggs of all crocodilians. 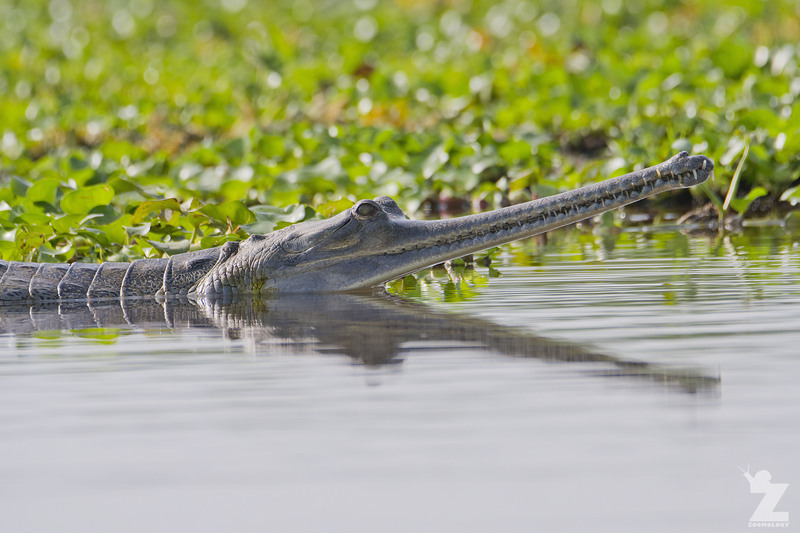 Their common name, gharial, is actually a misspelling of the Hindi word ‘ghariyal’. Adult males develop a bulbous nasal appendage which resembles an Indian pot called a ‘ghara’. This is what the Hindi word ‘ghariyal’ refers to. They use this appendage as a resonating chamber and make buzzing calls and to blow bubbles during mating rituals. The gharial is the only living crocodilian that is visibly sexually dimorphic, as females lack the bulbous nasal appendage. Males are also considerably larger than females. Some extremes have been documented with males being 21 ft in length. Males form harems, in which they guard a group of females. Gharial are considered by some to be the most aquatic of all crocodilians. Their diets consist of mainly fish. Their specialised narrow snout aids in the reduction of water resistance meaning it is capable of snapping shut at lightning speeds. With government protection of the species and its remaining habitat, ongoing research, captive breeding programs and better public understanding, there may be hope yet for these fascinating creatures. Although this was our first encounter, we hope that it won’t be our last. Hey Emma and Tom, loved your post about this fabulous, fascinating creature. I’ll be doing a post tonight that has a play-on-words on dinosaur. Would you allow me to recommend people visit this post of yours and could I use the bottom photo as a sweetener? Hi Liz, thank you! Yes, of course! 😊 Please feel free to use the photo. We always feel happy that you would want to recommend one of our posts. 💕 Looking forward to your blog! The gharial is amazing. We saw one once and couldn’t believe it is real. I sure hope it is conserved and protected. That’s awesome, Pam! Where did you see your gharial? We couldn’t quite believe it when we saw them either.